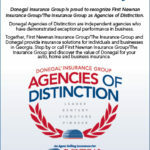 The Progressive Group of Insurance Companies has always focused on finding new and affordable insurance solutions to its customers. Innovators since 1937, Progressive became the first to introduce reduced rates for low-risk drivers. From Million-Dollar Legs to Infinity – and Beyond… There’s Insurance for That! Bailey’s Beads and Diamond Rings and Coronas, Oh My!